We introduce you to those currently “in the game” of film, television, animation, music, sports, gaming and tech! just bring your desire to learn! We help you work with the latest equipment and software being used by professionals in the film, music and tech industries. Get your free pass here for the next Artist Spotlight Microsoft Store Series April 18th in Atlanta! Participate in our classes and workshops to hone your knowledge and level up your craft! Need we say more? Cameras, lenses, DAW’s, tools, tips, sounds, techniques and all the good stuff! We talk shop here! 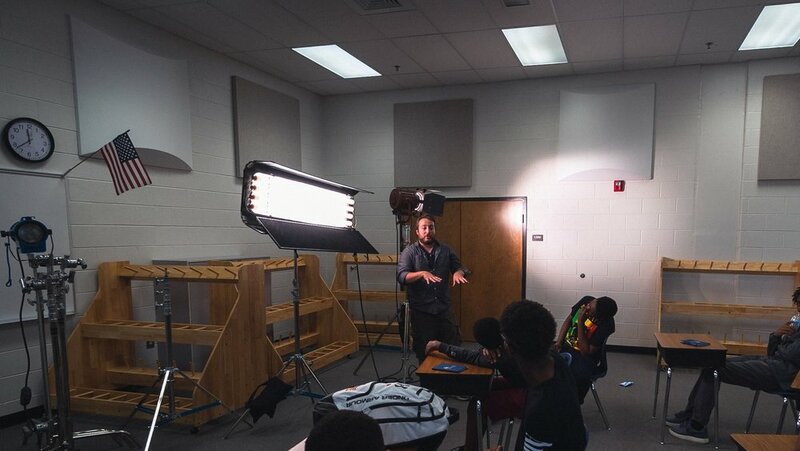 We offer a myriad of programs geared to k-12 public and private schools, non-profit organizations, as well as individuals looking to pursue a media or creative career. Come join us at one of our Workshops at The Microsoft Store. Meet industry pros in a cool, laid-back setting where you can feel comfortable engaging with both your peers and mentors. We strive to give our community the “real deal” of what goes on in the studio, on set, in corporate office and in the writing rooms! We bring the party to you, so you can engage, be mentored and hopefully even work with the people in your chosen industry…for real! Artist Spotlight is an educational media company, where newcomers and aspiring creatives from all facets of the tech, media and entertainment industry can get exposed to new careers. Our mission is to create opportunities to meet, collaborate, learn, and be mentored by professionals in the creative industry. We have industry professionals at the Artist Spotlight Xperience who have worked with companies and projects such as the The CW Network, NBC Television, OWN Network, Home Depot, Tyler Perry Studios, Netflix, and other feature film, television, commercial and corporate projects. Artist Spotlight Series: Business & Beats, featuring Producer OG Parker, Epic Records’ Cory Sparks, Songwriter London Jae, and Producer Nonstop Da Hitman! Microsoft Store, Atlanta Perimeter on Thursday April 18th! Come network with us and hear tips from these top music industry hit-makers on getting your sound, business and brand on point to succeed in this industry! The Media, Tech & Arts Academy is our K-12 platform, designed to help youth build self-confidence, encourage creativity and self-expression,and cultivate personal resilience. We work in hand with public, private and charter schools, as well as community organizations. We provide classes, after-school programs, summer camps, virtual lessons and professional exposure to schools, students and parents in school districts and communities of every income level and demographic. We collaborate with our local film, gaming, animation and corporate community in an effort to give our students unforgettable experiences and invaluable knowledge to shape their future. We have industry professionals at the Artist Spotlight Experience who have worked with such companies and projects such as the The CW Network, NBC Television, OWN Network, Home Depot, Tyler Perry Studios, Cannes Film festival and other feature film, television and commercial projects. Live shows, featuring industry leaders in film, TV, music and art, as well as contests for up and coming creative talent to gain opportunities to get their foot in the door of entertainment and media! VIP podcasts and webinars, where you can get the latest knowledge on how to advance your career.